Mountview is well served by the Transport for London (TfL) overground train and bus networks. Further information about travel by bus, train or tube can be found on the TfL website: Transport for London – plan your journey. A huge range of buses stop just outside our building on Peckham Hill Street, with excellent links to major stations and tube stops Elephant & Castle (Northern Line), Vauxhall (mainline rail/Victoria line) and Waterloo. Local buses also go further into south London to destinations including Lewisham, Dulwich and Catford. The London Overground (Orange line) leaves every 15 minutes from Peckham Rye and Queens Road Peckham. This line, as well as reaching many neighbourhoods in South West and East London, links to Canada Water (Jubliee Line), Clapham High Street (Northern Line), Whitechapel (District/Hammersmith & City Lines) and Highbury & Islington (Victoria Line). Good bus and mainline rail links also serve the Tube. Peckham Rye station has four services per hour to London Bridge (12 minutes) and two services per hour to Victoria (15 minutes). In addition, the Thameslink service serves major central stations including Blackfriars and St Pancras International. 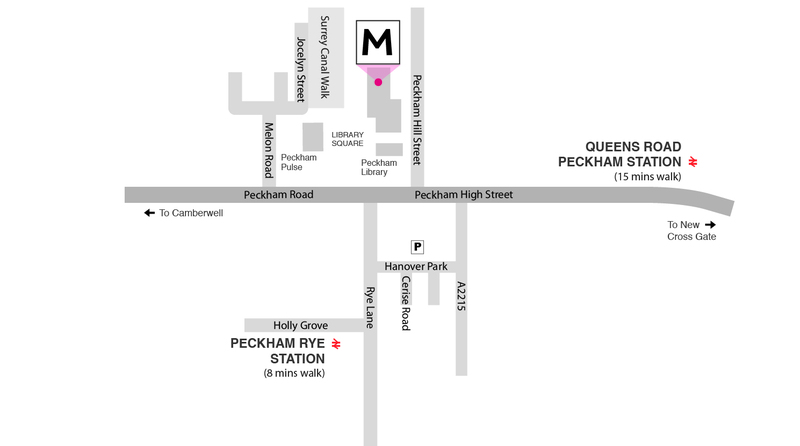 Peckham is just three miles from the South Bank making walking and cycling easy options. Surrey Canal Walk runs down the side of our building and into Burgess Park. This links up with cycle paths going into the City and West End via Elephant and Castle. Cycle racks can be found around Library Square and Peckham Hill Street. Mountview has very limited parking for disabled patrons only. Please call ahead to arrange use of this space. A public pay-and-display car park can be found behind the Aylesham Shopping Centre. National Rail services link up to TfL’s networks from Gatwick, Heathrow, Luton, Stansted and London City airports.